It’s been widely reported in journals such as Nature, and elsewhere, that “most cities might be too hot to host the summer Olympic Games after 2085 because of climate change”. Only 25 cities in western Europe – and just eight in the rest of the Northern Hemisphere – are deemed “suitable” to host the 2088 Games. 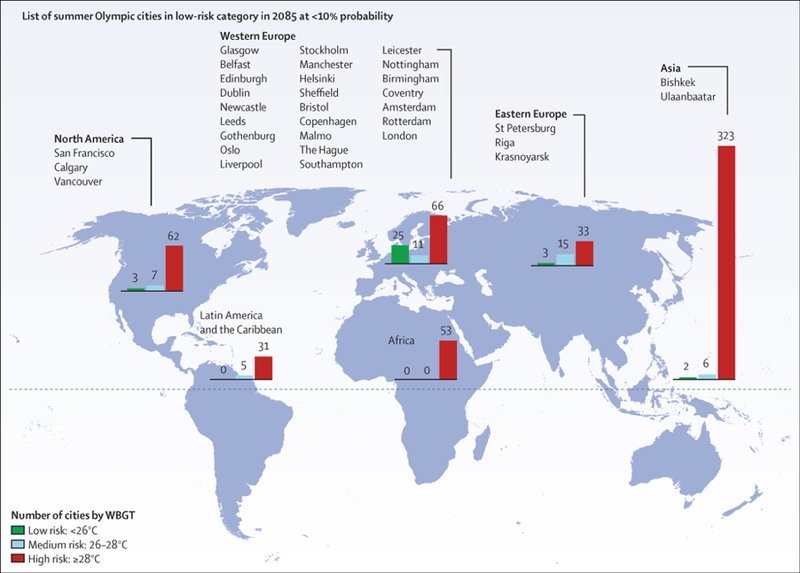 The detailed study, which integrates climate modelling with biometeorological factors affecting human comfort, is most impressive; however, it overlooks the political and financial dimension to the host city selection process: Host cities are rarely ever selected for their climate suitability. Most outrageous of all, perhaps, was FIFA’s selection of Qatar as the host of the 2022 World Cup, despite the knowledge that the average daytime high in most of the desert country regularly exceeds 50°C (120°F). FIFA’s own evaluation of Qatar’s bid acknowledged that the heat is “considered as a potential health risk”. Organizers have since moved the 2022 World Cup to November and December, but not without creating chaos for most of the world’s domestic soccer leagues who now have to change their annual schedules. So, while climate change will undoubtedly exacerbate the host city (or nation) bidding and selection process, it’s clear that we won’t have to wait until 2088 to see the misalignment between global sporting events and climate. Posted on September 13, 2016 by Mark Bessoudo. This entry was posted in Environment, Middle East, Politics, Sports, Sustainability. Bookmark the permalink.